Day 6: When today is just too much. I’m a bit of a pen snob. Cheap paper, but nice pens. So, as I write here–on a sturdy-yet-elegant handcrafted wood farm table in a 19th floor apartment in Chicago with twelve ceiling-to-hip windows on both the east and the west wall framing up a breathtaking sunrise over Lake Michigan with a pale blue somehow fading to electric calm orange–as I write here in this room flooded with gratitudes, my mind can’t get around this stupid pen. 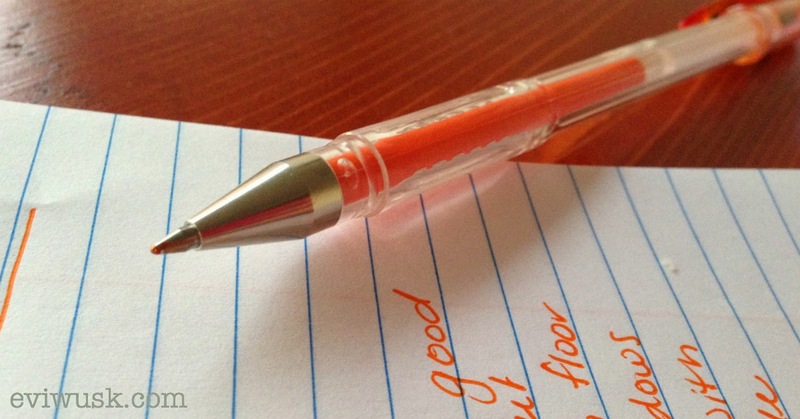 It writes nice, I guess, smooth, the grip not bad, but the ink is this orange that I can’t seem to get over. Some days, even when we know in our heads that there is grace, gratitude swimming all around us, our hearts can only see the negative, feel the hurt, annoyance, or overwhelm that is just our luck–today. Oddly, the same thing happens on the other end of the spectrum. We get so flooded on some positive days that we forget to give thanks, just gorging on a buffet of goodness that, if we think about it, we didn’t orchestrate ourselves. This weekend I was at such a buffet, but the meal was plated and surrounded by more glasses and silverware than I quite knew what to do with–a wedding, beautiful in every sense of the word. Fragrant lilac bouquets, a couple who wrote their own vows, both gifted wielders of words, and a stained-glass window all framed the promises. “I will do my best for you, be my best for you, slow down for you,” he said. At both ends of the spectrum all we can do–when completely empty or filled to overflowing–is cry. Both the empty and the over-filled distract us from realizing that all we can do in these spaces is offer up a whisper of thanks, bold in our noticing. My sister taught me once about how we can approach these days, these ones that threaten to bowl us over with emotion. When overwhelmed, she says, we are looking at the pen from the tip down. The tip (today) seems like all there is, but when turn the pen to the side, we see it for what it is, just a blip on the whole pen, the longer story of our life. Today, take a moment to stop, to notice the tip, but keep it in perspective and give thanks. Otherwise, you just might miss the orange pen ink, pointing us to something greater. #146. Orange pen ink. . . actually like the sunrise. Reflect on a challenge, annoyance or recent sadness in your life, dare to mine it for a whispered gratitude. *This post is part of a 30-day gratitude challenge. Subscribe via e-mail (on the left) and post a gratitude to WIN A PIE here. Oh, Evi, my gratitude-go-to-gal, you have such a way with your thoughts and a way with your words that reached me to the depths of my soul today. As you know, we lost a very, very special man in our lives Thursday. What I haven't yet told you is that while we were still reeling from that unexpected loss, we lost a very special young person in our lives…my husband's lifelong best friend's son, age 16. Evi-I'll be the first to admit that I got behind on the blog, have had a hard time focusing on finding the 'good' the last few days, but your orange pen post, with tears streaming down my face, sure did me a world of good. Thanks for being you! Advising is my recent challenge. Am I steering these wonderful students in the right direction? I am helping them to create a plan that works for them, will help them graduate on time, will not feel overwhelming to them? With each one, I build a little confidence. I am creating a map to guide them and I have tools to work with that help me create their compass. My gratitude goes to those who have created tools for me to use, for colleagues who have shared words of wisdom, and for patient college kids! I can do this, I can slay the advising monster!